The Fall 2017 edition of GLASS: The UrbanGlass Art Quarterly (#148) will hit newsstands and subscriber mailboxes next week. The issue marks a major upgrade in paper quality to better showcase our recent total redesign. The result is superior photo reproduction with richer colors, deeper saturation, and sharper details, all of which make the cover image of a tautly furled thread vessel by Toots Zynsky even more striking. In the featured article, regular magazine contributor Alexander Castro spends time in Zynsky's Providence, Rhode Island, studio, where he learns of the creative ferment spurred by the artist's recent Specialty Glass Residency at The Corning Museum of Glass and Corning Incorporated. Access to new materials have rekindled Zynsky's passionate interest in experimentation, which Castro investigates as he also considers her established, and much-coveted, sculptural vessels made through a process of fusing thousands of delicate glass fibers that are hand-formed into complex objects that display "tidal movement," which Castro writes "isn't superfluous but integral to their being." 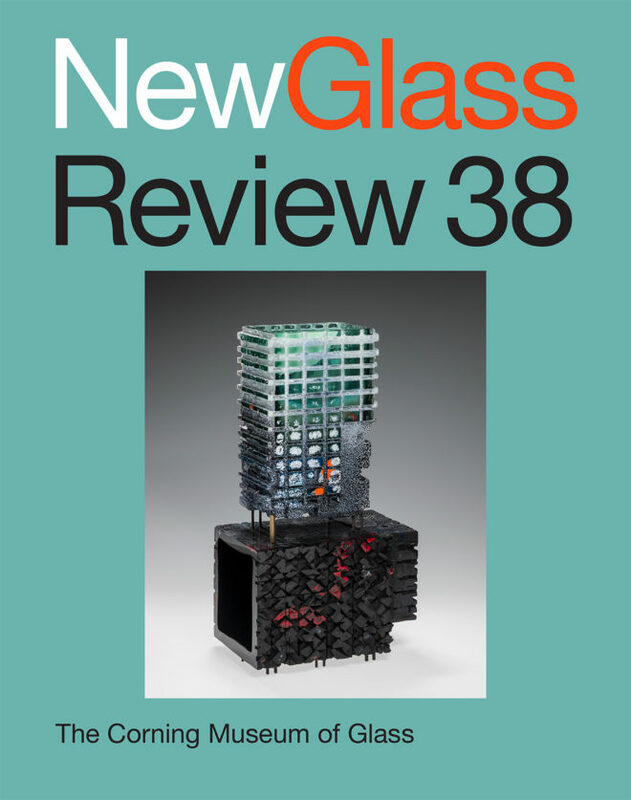 The cover of the upcoming edition of New Glass Review features work by Thaddeus Wolfe. 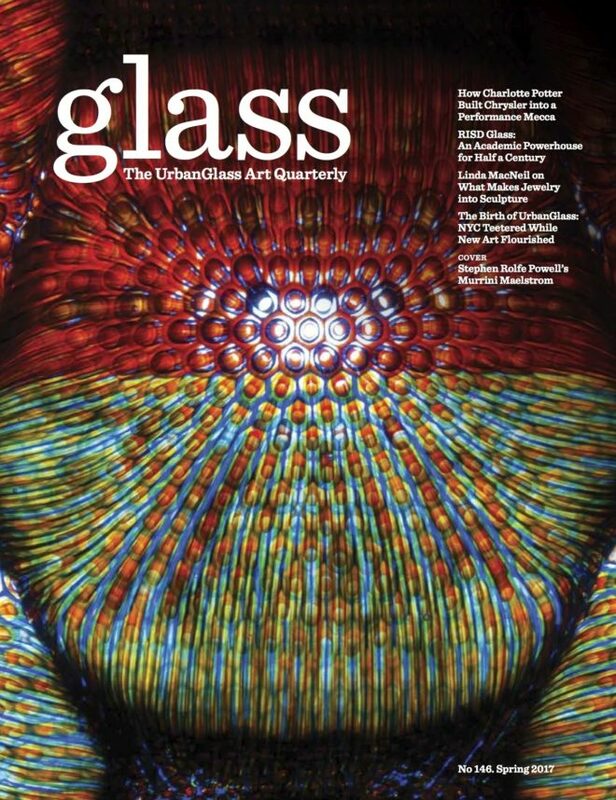 The Summer 2017 edition of GLASS: The UrbanGlass Art Quarterly (#147) is hitting newsstands and subscriber mailboxes next week. 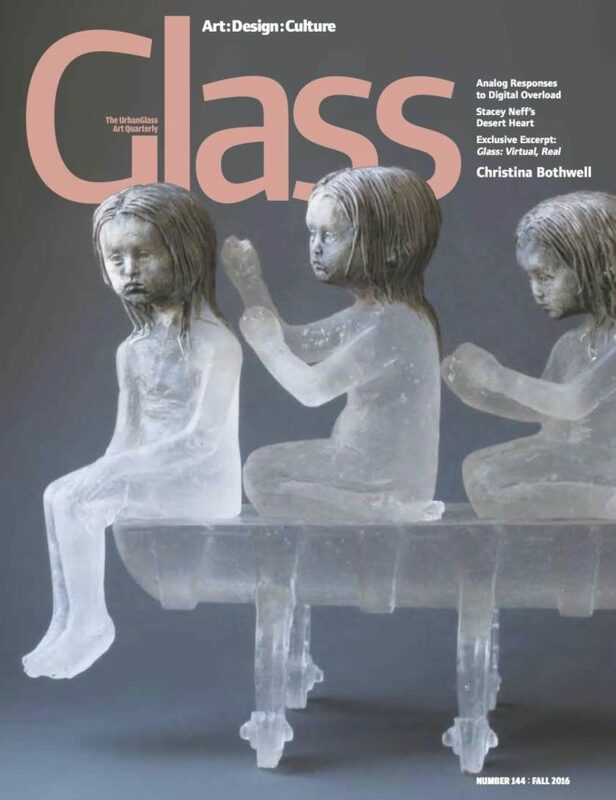 Once again, GLASS is partnering with The Corning Museum of Glass to distribute the latest edition of its annual exhibition-in-print, New Glass Review (#38), which is bundled with the summer issue of GLASS magazine at no extra charge to subscribers (newsstand copies carry an increased cover price for the special bonus issue). 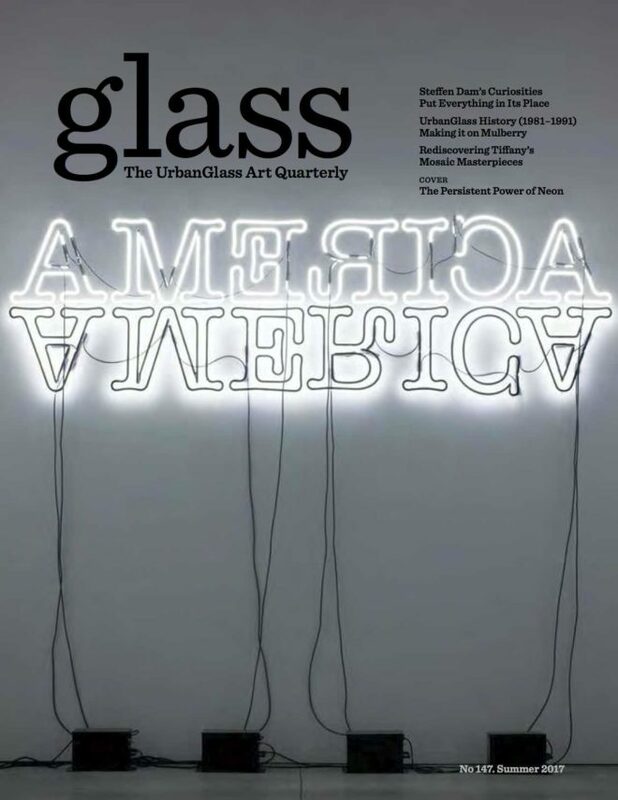 On the front of the new edition of GLASS is a striking work in neon and paint by celebrated American artist Glenn Ligon investigates issues of racial identity, American history, as well as the nature of language itself. The 2012 work Double America, features the word "America" shown twice, in white neon and inverted and painted black, creating a powerful graphic that challenges the nation's ideals and aspirations at a time when the country is so profoundly divided. 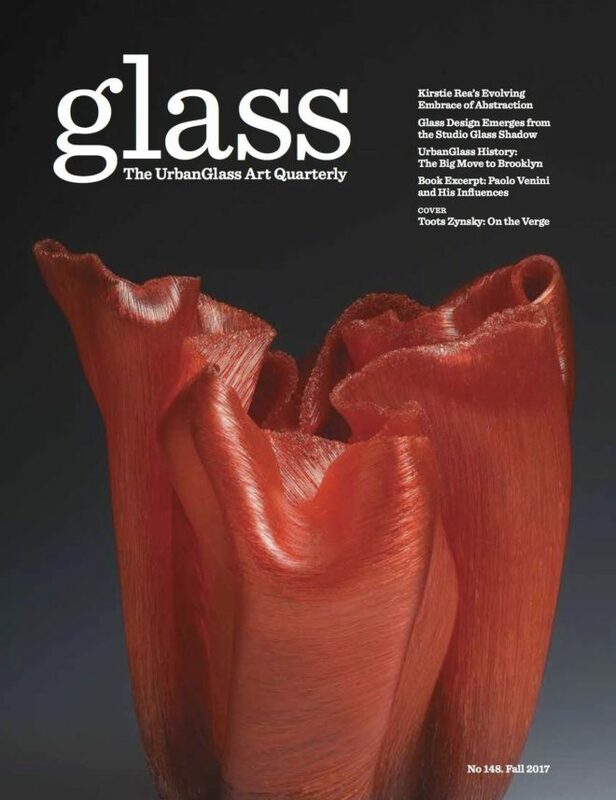 As a special bonus, current subscribers to GLASS: The UrbanGlass Art Quarterly will once again receive the latest version of The Corning Museum of Glass's annual exhibition in print of notable new work for no extra charge. Overseen for the first time by Corning's new curator of modern glass, Susie Silbert, New Glass Review 38 will identify the 100 most important new works in glass from over 1,000 submissions from around the world. Subscriber copies will arrive in mailboxes on June 1st, 2017, poly-bagged with the extra bonus of the beautifully printed 2017 edition of New Glass Review. Newsstand copies will also include the extra bonus issue, but the retail cover price will be higher than the typical $11/copy. Subscribers, who already enjoy a discount off the cover price, pay nothing extra to receive this definitive publication that has successfully picked some of the most important new artists to emerge in its nearly two-decade run. The cover of GLASS: Virtual, Real scheduled to be published in Fall 2016. 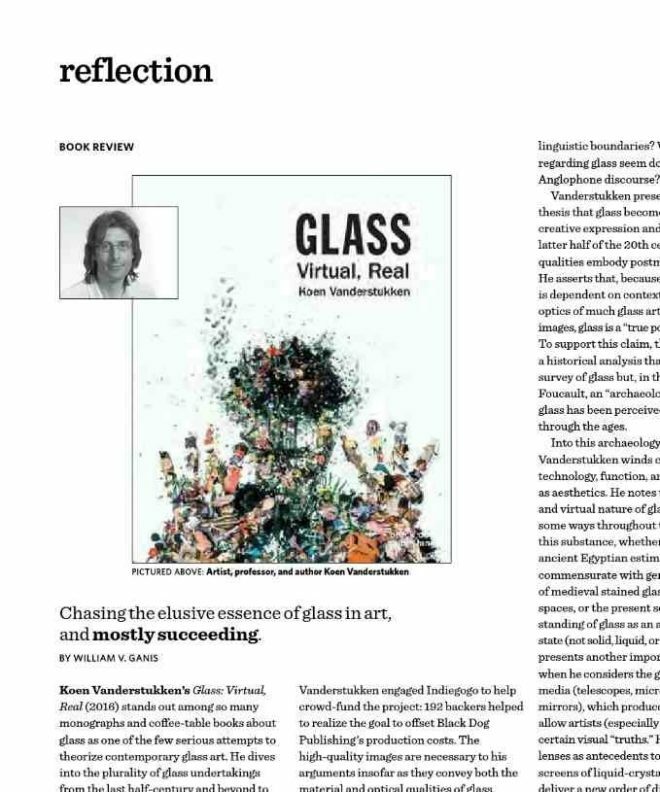 The back-page "Reflection" essay in the newly published issue of GLASS: The UrbanGlass Art Quarterly (Spring 2017, #146) is dedicated to an in-depth book review of a new scholarly work by Koen Vanderstukken, an artist and head of the glass program at Sheridan College in Ontario, Canada. The GLASS Quarterly Hot Sheet talked with the reviewer — the magazine's contributing editor William Ganis, who is also the chair of art and design at Indiana State University — about his assessment of this major new work. The Spring 2017 edition of GLASS: The UrbanGlass Art Quarterly (#146), on its way to newsstands and subscriber mailboxes, sports a new look. Completely redesigned in honor of the 40th anniversary of its parent, UrbanGlass, the new issue features an updated graphic style with fresh type treatments, more abundant white space, and an increase in photographs of individual artists as well as their work. It's the first major update to the magazine's design since 2003 and reflects the keen insights of the magazine’s longtime art directors, Stephanie and John Stislow, who for more than a decade have been honing the visual presentation of articles by some of the top arts writers to illuminate their critical insights. The Winter 2016-17 edition of GLASS (#145) is hitting newsstands and subscriber mailboxes this week. 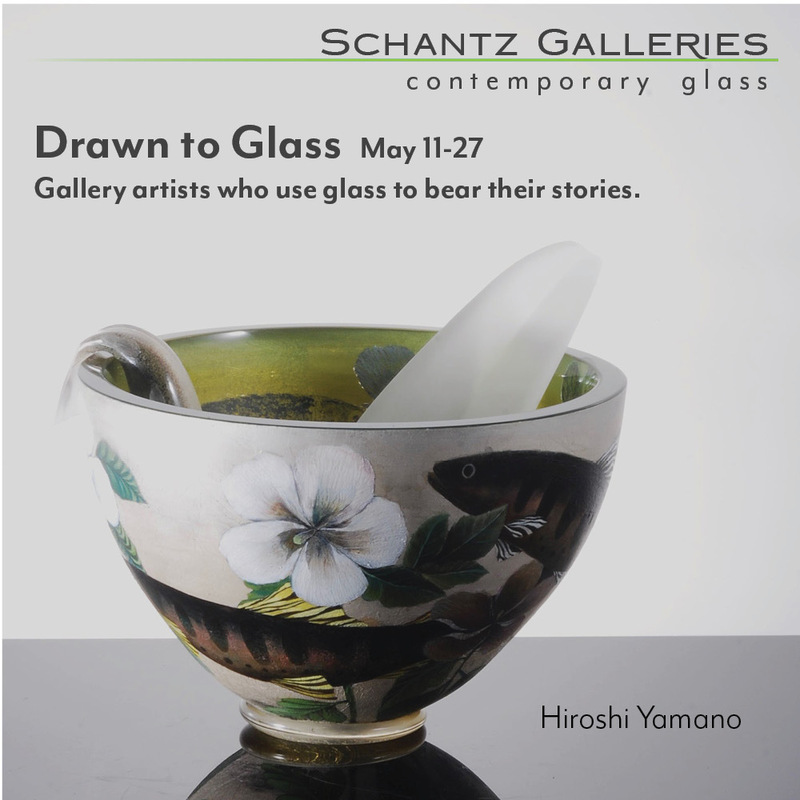 The four feature articles explore different aspects of the profound transition affecting glass art and design. Whether it's the aging of a loyal collector base that sustained its growth for decades; new technologies competing with, if not displacing, hot glass studios as the showpieces of college and university art departments; or the steady march of globalization finally encroaching on the price points at the high end of design, GLASS brings you unique insights into the changing dynamics of the field. 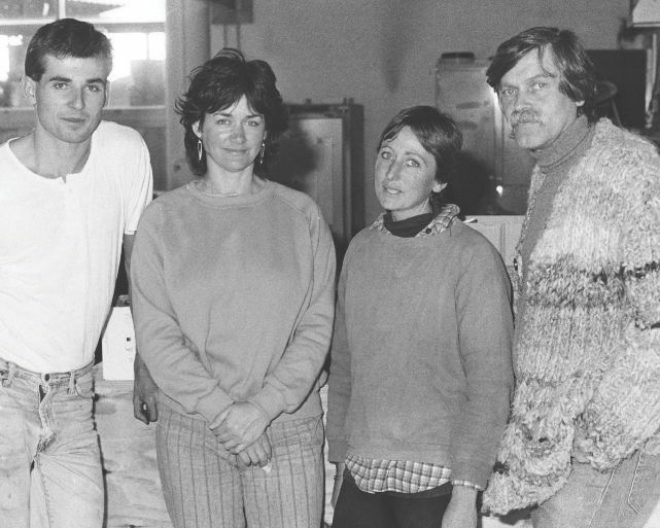 The Glass Workshop circa 1986 (l to r): Richard Whiteley, Velta Vilmanis, Kirstie Rea, and Klaus Moje. The recent passing of Klaus Moje (1936 - 2016), who died at the age of 79 on September 24, 2016, after a protracted illness, has unleashed a global outpouring of grief and appreciation. Honored for his disciplined approach to technique and visionary work taking kiln-forming into the fine-art realm, Moje's impact on the glass art field is immeasurable. Celebrated as an artist, Moje was also hugely influential as an educator, and created the glass program at the Canberra School of Art, which has since been incorporated into the Australian National University's College of Arts and Social Sciences. Consciously not opening with a hot glass furnace, Moje designed the program in 1982 with a radically different approach than most glass education facilities in the world. 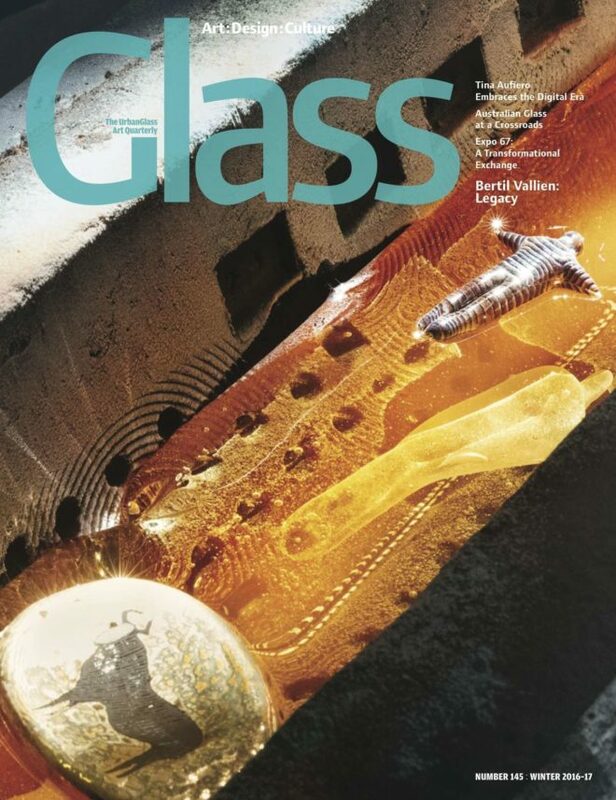 In honor of Moje's legacy, the GLASS Quarterly Hot Sheet is republishing an article from the Spring 2005 print edition (GLASS #98) that provides unique insight into the founding of the Canberra program. In the article below, Moje shares his singular perspective on not just education but what it takes to become an artist. The Fall 2016 edition of GLASS: The UrbanGlass Art Quarterly (#144) is hitting newsstands and subscriber mailboxes next week. On the cover is a work by Christina Bothwell who creates sculptural vignettes using cast glass and ceramic elements. In Bothwell's hands, the smooth, shiny aspects of glass are hidden by pocked surfaces or rubbing with oil paints to further dull the finishes. Undimmed is the ability of glass to capture and transmit light, creating a glowing effect that effective serves the work's central themes of transformation, dreams, and the passage of time. A spread from the cover article on Martin Janecky in the Summer 2016 edition of GLASS (#143). 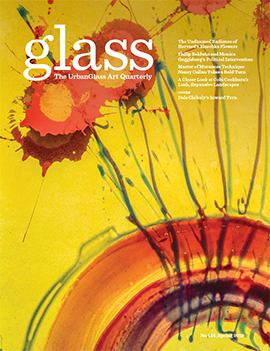 The Summer 2016 edition of GLASS: The UrbanGlass Art Quarterly (#143) is hitting newsstands and subscriber mailboxes next week. It comes bundled with the just-published 2016 edition of New Glass Review (#37), a special subscriber bonus at no additonal charge (the special GLASS plus New Glass Review bundle is also available at select newsstands, but at a higher cover price). 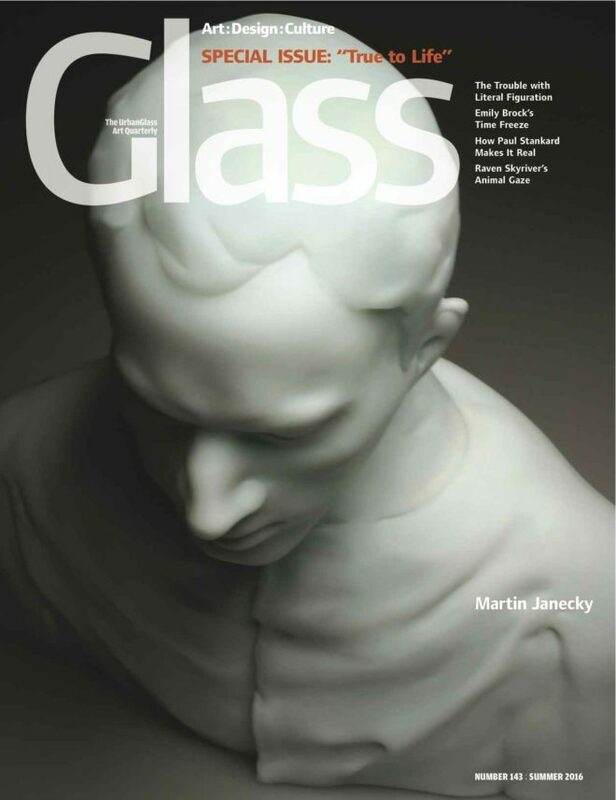 Gracing the cover of the new edition of GLASS is a striking work by hot sculptor Martin Janecky, who has built on the advances of William Morris and his collaborative team, and added his own techniques to take three-dimensional glass into portraiture, with new levels of detail and precision. Students flock to Janecky’s classes, awed by his ability to sculpt full-scale human busts in real time, statues emerging magically while the glass is still hot on the pipe. Contributing editor John Drury experiences the magic by sitting for a portrait by the rising Czech star as part of his research for this article, which examines how Janecky is moving into more complex rendering of human form while developing a rationale for his highly realistic approach. 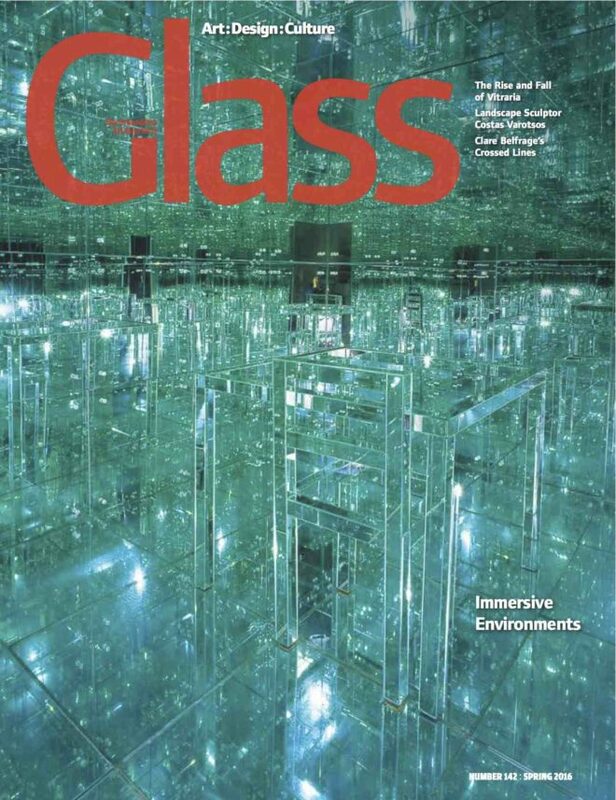 The Spring 2016 edition of GLASS: The UrbanGlass Art Quarterly (#142) is hitting newsstands and subscriber mailboxes at a moment when virtual reality is poised to go mainstream. Devices that turn your cell phone into a headset are already shipping to curious consumers, the Sundance Film Festival highlighted interactive experiences in an exhbition called "New Frontiers," and even an organization as august as The New York Times has been releasing online reports designed to envelop users in a digital experience. More complex headsets and interactive accessories are getting ready to ship. All of the buzz about virtual reality inspired us to remind the world of the rich terrain already mined by visual artists, who've used installations, architecture, and sculpture that create new realities through repeat reflectivity, partially mirrored glass surfaces, and cultivated perceptual shifts that play with optics to alter our relationship to the world around us, and force us to reconsider our place in it.